By Edward R, Brandt, Ph.D., Mary Sutter Bellingham, Kent Cutkomp, Kermit Frye, Patricia Adams Lowe, and Paul Sternberg. A comprehensive 660 page handbook for Germanic family-history researchers is written and published by GGS with a lay-flat binding.. This third edition is highly recommended by librarians and researchers. The book may be purchased from GGS, member can recieve a reduced price. Check out our GGS Store to get your copy today! 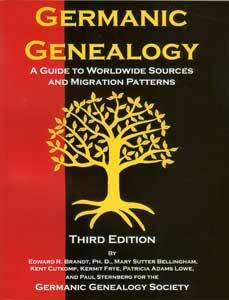 This is a hands-on guide for beginning and intermediate Germanic-genealogy research. 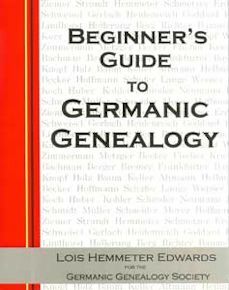 This 100-page guide for beginning Germanic-genealogy research includes six worksheets to guide your research, a clear goal, and easy-to-read essays on 39 essential topics. This low-cost guide will save you time and frustration as you proceed. It also includes worksheets to direct your research and easy-to-read essays on essential topics. The book may be purchased from the GGS Store. A highly regarded 32-page quarterly publication sent to GGS members. The articles, often written by GGS members, focus on a variety of topics including: research strategies, summaries of GGS presentations, reports on genealogical travel, book reviews, historical information and member's success stories. A selection of past issues are available for sale from the GGS Store. Members have access to past issues in the Member's Only section of this website. However, here is a sample issue of our Journal. Index is searchable use Ctrl-F.
Index is by topic and then chronological by volume:number:page. Articles in Gleanings refer to other periodicals in the Society's Library Holdings. Submissions are welcome. Send a draft of your article to the Journal Editor or see our Contact Us page for our Web Contact form addressed to the Journal Editor . 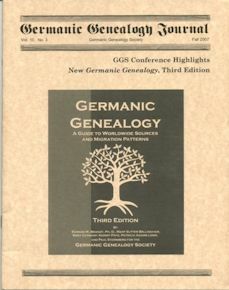 This index to the Deutsche Zentralstelle für Genealogie [German Central Office for Genealogy] collection of family histories of Germanic and Central European people begun in 1922. The collection includes Ahnentafeln [pedigree charts] and family group records, and an Ahnenstammkartei [Card index] of 2.7 million names. This book helps you locate the correct microfilm to find your surnames within the Ahnenstammkartei [card index]. It is paperbound, perfect binding and 133 pages. Note: we are closing out this item - only one remains in stock. This book is the Catholic St Wenceslaus and the Protestant Czech National Cemetery containing German Bohemian Burials. This is a Paper bound book of 185 pages completed in 2001.